It doesn't matter how often you back up to that huge external hard drive sitting on your desk -- you're still at risk of data loss! Why? Because that huge external hard drive is SITTING ON YOUR DESK. It's probably plugged into the same power strip as your computer. Just one bad storm, one power surge, fire, flood, or other disaster (spilled glass of soda? Super Soaker attack?) and the data on that external drive is just as fried as the data on your computer's drive. The solution? 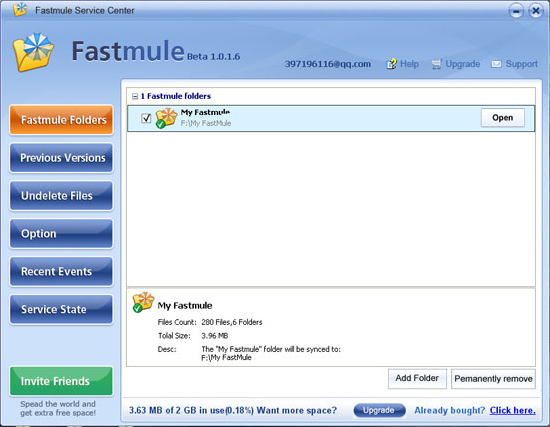 Online backup, with FastMule! 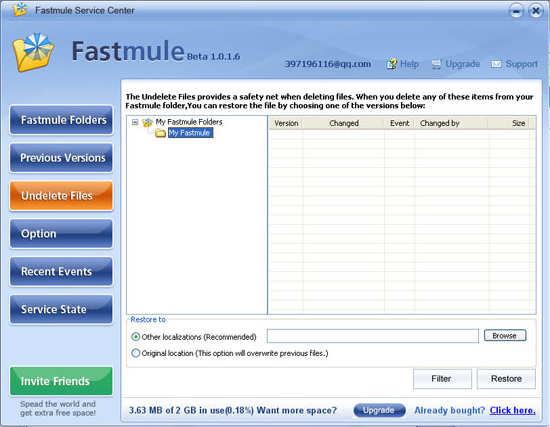 FastMule is your automatic solution for backing up and syncing files across all of your computers! With FastMule, you enjoy the same level of encryption as with online banking as your files are whisked away to a secure, offsite server OUT THERE. Not only does this secure your data against physical damage that occurs at home, it also gives you the benefit of being able to get to your data from anywhere, anytime. Featuring automatic detection, backup, and sync of any changes to files or directories, FastMule is the quickest way to ensure that all of your important data is backed up, all of the time. No more scheduling backups, or remembering to run a program! Even better, you can roll back to previous versions of a file, just like that, if you ever accidentally delete or overwrite something important. Working in conjunction with your FastMule account, FastMule lets you select which files and folders to back up just by dragging and dropping them into a FastMule folder on your desktop. It's that easy! After you purchase Fastmule Unlimited Online Backup, it may be used for 36 months. Enjoy safe and secure online backup of your important data. Avoid data loss from catastrophes that affect both your computer and your onsite backup drive. Avoid the tedium of scheduling backups. Roll back to previous versions of any file or folder. Select files and folders to back up by simply dragging and dropping them into a folder. After you purchase Fastmule Unlimited Online Backup it may be used for 36 months and will not function after that unless you renew your subscription. Fastmule Unlimited Online Backup is licensed per user, so if more people are going to use Fastmule Unlimited Online Backup you will need to purchase additional copies. Upgrades to future versions of the software will be free for 36 months. For versions after that, upgrades will require additional payment, which will not be discounted. (1) It's good to know it's possible to save some essential datas on a secure place outside one's local place, as you said in case of a larger disaster. So, how distant are the datas stored on your side? Different rooms, houses, cities, countries? (a) I don't understand the encryption-security handling. My first thought was when the datas are transmitted, they get encrypted on my computer and than sent,. So a potential attacker sitting on the line would have no chance to decrypt them? And they are also safe from the looks of the storage-company, i.e. (sorry) you. But the only place, where I can enter a password is my account. And - of course - you need to know this password to let me access to my data. (5) Is there another way to access to the stored data, but your tool, e.g. DirectoryOpus, etc. That would be nice. Richard Andersen If you're satisfied with 256 bit AES, you could use Second Copy to generate encrypted zip files. It can encrypt each file individually, if you like. You can even re-encrypt these zip files as many times as you like, very easily, with this program. You just set up a profile, afterwards it all runs automatically with a click on a button. Afterwards you can upload the encrypted files to Fastmule, Mozy, Carbonite or some other online backup service. Peter M @Richard: that would be great, but encryption of tiny files supposedly can be easily broken, which would then compromise all the other files baked up like this. I've read a lot about encryption but never heard that small file size makes it easier to break an encryption algorithm. Could you perhaps point to some more information about that? Stefan Hauber That's strange: In the policy you are always talking about 36 month, i.e. 3 years, but when clicking on the buy-button there is only a 1-year subscription to buy. So what is it: 3 years or just 1 year? Here it state 36 month....but if you look at the site...then $49,95 is for 1 year service...3 years is $119,95. Peter M @Richard: look for "small files" in http://www.winzip.com/aes_info.htm - don't know if Second Copy works like WinZip11 in this respect. But I also read something about small files being easier to brute-force, don't remember where it was.Then again, I don't trust any closed source for encryption anyway. What is the bottom line price? As stated or something else? I lke the idea you have but I prefer to know what I am getting into. As for those who have written about governments looking into everything, I can comment that my husband was a founder of the CIA and he assured me that ALL governments spy on All other governments. Whether that extends to the entire public is questionable. They ought to start with the big companies and very rich people who keep their money in off shore companies and tax havens. There are enough of those to keep the governments busy for years. Guarantee! They will not do it. Alan Ehrlich Anybody have an idea why the fastmule website is rated unreliable by WOT? This always raises a red flag with me. Nico Westerdale WOT (Web of Trust) isn't always spot on - they take up to 6 months to update. Personally I'd go more on the comments than anything else. Luo Gang Yeah, that is right! So please feel free to use our FastMule! Luo Gang Please note that one-year subscription for Fastmule Unlimited Online Backup costs $34.97 only as stated! "What is the bottom line price? As stated or something else?"